“All of this research is going toward finding combinations of immunogens to aid in protecting people against HIV infection,” said TSRI Professor Ian Wilson, Hanson Professor of Structural Biology and chair of the Department of Integrative Structural and Computational Biology at TSRI. “Together, the two studies reiterate how structure-based immunogen design can advance vaccine development,” said Wyatt. Guenaga needed the molecules to stay together as a trimer so his co-author Fernando Garces could get a clear image of the clade C glycoprotein’s trimeric structure. To solve this problem, Guenaga re-engineered the glycoprotein and strengthened the interactions between the molecules. “We reinforced the structure to get the soluble molecule to assemble as it is on the viral surface,” Guenaga said. In a companion study, the scientists worked with a team at the Karolinska Institute to test an immunogen based on Guenaga’s findings. The immunogen was engineered to appear on the surface of a large molecule called a liposome—creating a sort of viral mimic, like a mugshot of the virus. 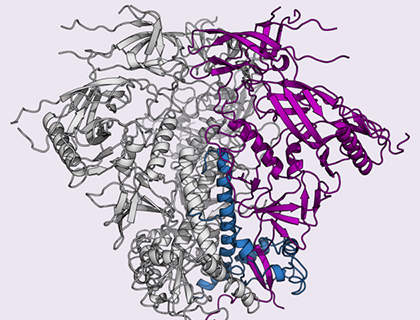 In addition to Wyatt, Wilson and Guenaga, the study, “Glycine substitution at helix-to-coil transitions facilitates the structural determination of a stabilized subtype C HIV envelope glycoprotein,” included co-first author Fernando Garces, Natalia de Val, Viktoriya Dubrovskaya and Brett Higgins of TSRI; Robyn L. Stanfield of TSRI and IAVI; Barbara Carrette of IAVI; and Andrew Ward of TSRI, IAVI and the Center for HIV/AIDS Vaccine Immunology & Immunogen Discovery (CHAVI-ID) at TSRI.